Turn on the car lights. Are they dim? If so, you may have poor battery connection or a dead battery. Find someone with a working vehicle to help you jumpstart your car. 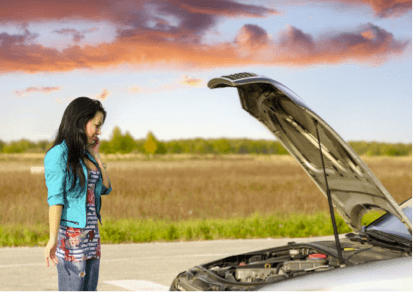 This should establish a charge in the dead battery that will let your vehicle run for around 30 minutes — use that time to get to your local auto repair shop. Mechanics will be able to properly test your battery to see if you need a new one. This may be a sign of a serious problem. In many cases, this is due to a bad fuel pump, a broken timing belt, or even an inoperative crank sensor. Call your local auto repair shop to let them know what’s going on, and have your vehicle scanned for codes with a proper code reader or scan tool. 1. 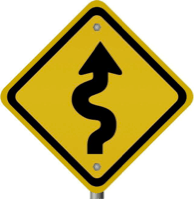 When you see these signs along the road, what should you do? 3. True or false: You should let your engine warm up for a few minutes before driving. 4. True or false: Answering a text takes away your attention for about five seconds. That is enough time to travel the length of a football field. Answer Key: 1. C. 2. B. 3. False. Modern engines warm up more quickly when they’re driven. The faster that happens, the sooner they reach maximum efficiency—which means the best fuel economy and performance. 4. True. Cell phone distractions cause around 1 out of every 4 of car accidents, and you are 23 times more likely to be in an accident if you’re texting while driving!